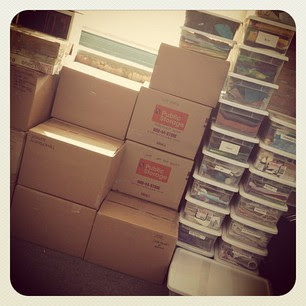 I havent completely dropped off the face of the earth, I am in the midst of a packing frenzy. We got approval on our short sale last week and have an ambiguous closing date of any time between the first and middle of October. So now my ex and I are going through more than 20 years of shared belongings, packing and ruthlessly purging as much as we can. Because we don't know specifically when the closing will be, it's really hard for me to make any plans for finding a place to live. If we close the beginning of October, I'll drive to my mom's in California, begin looking for a place, then fly to Houston at the end of the month for International Quilt Festival. If we close the middle of October, I'll drive straight to Texas instead, stay with friends in Austin, then drive to California the second week of November. On Wednesday I take a short break from packing and fly to Springfield, Missouri to give a lecture and teach a workshop for the Ozark Piece makers guild show, then fly back Saturday to resume packing and maybe? by then I'll have a better idea of when I'm actually going to be moving. Moving is hard enough, but with the shows and classes, I don't know how you do it all. Sounds like it would be easier to rent something short term so you have a place to live and be able to take your time and find the perfect house for you. Debbie I will definitely be renting. After buying and selling so many times over the years and losing all of the equity we had built over 25 years, I have no desire to buy anything, besides it won't be in my budget for years to come. Having to sell my condo and move twice within three months earlier this year, I completely understand! You seem to be doing very well under the circumstances. I have no doubt you will land on your feet! Take a breather every now and again! reground yourself! GL on house hunting and a new start. This sounds like trying to maintain your balance in the midst of a hurricane. You're doing great! Hang in. Think of good it will feel when you get the key to your new place in California. I do believe that there is a reason why everything happens as it does - although the belief is sorely tested by the wait. Your new journey is beginning and you're beginning to step into the future. Have faith and be well - if not calm!